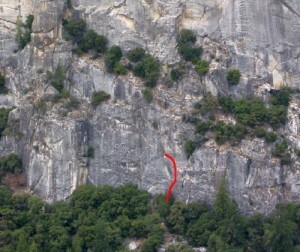 This juggy route starts up The Tube then makes a challenging traverse right. Place gear to clip the bolt then clean it to reduce rope drag (you essentially do the crux on toprope). Stay low at the crux. Above the difficulties ease, but there are a few more 5.10 moves between good rests. Which SuperTopo guidebooks include a topo for Polymastia?